Apparently since I didn't watch a movie at girl's night, I decided to make up for it by watching a gagillion movies this weekend. Seriously I watched a lot of them. More than I've seen in the last couple of weeks! Of course I'm sure that it helped that Brad worked almost all weekend, then Preston took some good naps, and it was rainy and cold outside so we spent most of the weekend inside. Are you ready for the list? Okay...here goes! I'll even tell you what I thought! Motherhood - I'd heard it was about a Mom blogger and umm hello? I'm a Mom blogger too! I expected to love it. Expected. I hated it. I was undecided on how I felt about it until the next day. It really made me feel crappy about being a stay at home parent. Boo on that! That's just my take though. Changeling - I'd been wanting to see this one for a while. Like since it was in theatres kind of while. It was good but it was sooooooo sad. I cried. It's Complicated - Hello HILARIOUS! Seriously it was sooooo good! Absolutely amazing! Plus I kind of love Steve Martin a little bit! Everyone should see this one. 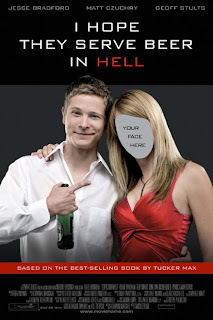 I Hope They Serve Beer In Hell - Brad had to do a little convincing to get me to watch this one. I was feeling very unsure. I mean, seriously what kind of a title is that? But I thought it was good! Definitely more of a raunchy humor kind of movie! Not for the kids! But I couldn't stop laughing! Even better? It's based on a true story and the blog of the guy the movie is based around. Apparently these are his actual stories, which really only makes it all the more funny! Rumor Has It - I've seen this one before but I love it! I really do! I just had to watch it! 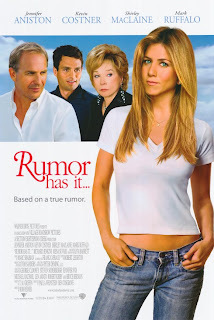 What can I say Jennifer Aniston and Kevin Costner. Most definitely worth watching more than once. 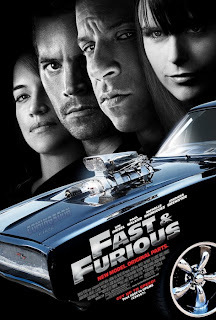 Fast And The Furious Four - I've been waiting to see this one! It's another one I've wanted to see for a while and just never got around to. It was good! Paul Walker, need I say more? Ahh, swoon! He is just so fun to look at! And not a bad actor either! Plus it was a good movie. It didn't disappoint. I'm really glad that they got so many of the original cast members back. I was such a slacker this weekend, but I did get a couple more notches in my movie belt. We watched "I hope they serve beer in hell" this weekend too! It also took some convincing for me to watch it but I thought it was hilarious!!! stopping by from SItS!!!! great list!I want to see It's Complicated Now!! beautiful family!! That's too bad about Motherhood, I was hopeful that it would be a good one. Oh well! Great to hear reviews for so many movies I have never seen. Thanks! Great films! 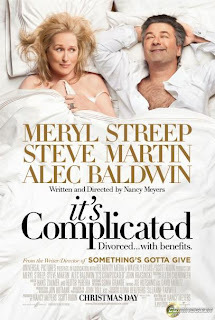 :) I want to watch it's complicated!! Looks like a great film! I cried in The Changeling too. Sad show. I haven't seen any of those except for the Fast and the Furios. Read the book I Hope They Serve Beer in Hell. It will make you pee your pants. Well, it made me pee my pants a little on several occasions. The movie is next on my netflix list! I love this list. Most of the movies don't seem my style... but It's Complicated looks hilarious. Fast and Furious Four seems right up my ally. Would you believe and action AND car lover has yet to see ANY of these movies??) This was a great post.